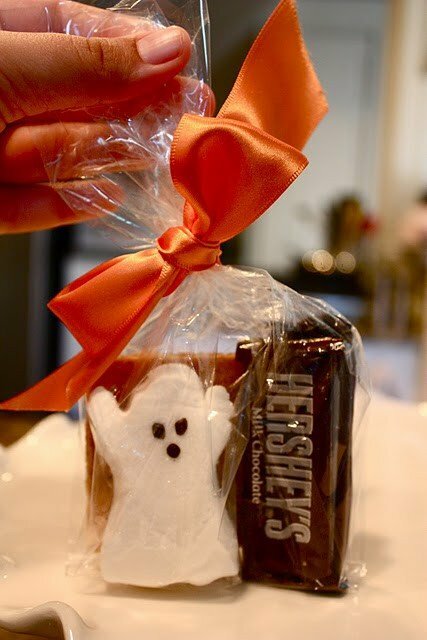 Found on Pinterest: Ghost Peep S’mores Halloween Favors! I’m obsessed with Pinterest. Obsessed. My friend Alissa is doing a great series on 31 days of Pinterest with a “special nod to potential holiday gift-giving”. Bloggers all throughout the blogosphere are finding inspiration and making friendships via this social media eye candy gallery every day. It’s genius and I love it. I’ve decided that every once in a while, whenever the mood strikes, I will “pay forward” something awesome I’ve found “pin-worthy”. I need to make sure I can actually find these ghost peeps…but if I can? These are SO the Halloween gifts for my kids classmates! I’m so excited! UPDATE: So it does not appear that the blog this originated on is “public” anymore. I’m glad I’m not the only one obsessed! 🙂 Those ghost Peeps are perfect – the kids are going to love that goody bag! Try making some homemade peeps! where did you find your ghost peeps?